Cinnamon biscuits are a favorite treat in our family. We love biscuits! It seems no matter what you do with a biscuit, we like it. Southerners are like that! 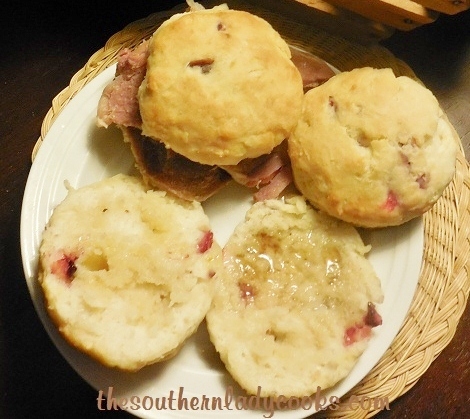 I make these sour cream biscuits as a breakfast treat but they are good warmed over anytime. Just add a tall glass of milk or a cup of hot coffee and grownups as well as children love this recipe. You might also like our recipe for banana beignets. Cinnamon biscuits are delicious with your morning coffee! In a large bowl whisk together the flour, baking powder, sugar, cinnamon, nutmeg and salt. Cut the butter in pieces and add to flour mixing until your flour looks like coarse crumbs. Butter should be cold. Add sour cream, vanilla and mix well with a spoon. Fold in raisins and milk and make into a dough, adding flour if needed. Pat or roll dough out (I just pat it out with my hands) on a hard surface and cut with a biscuit cutter. Place biscuits on a baking sheet. Bake in preheated 425 degree oven 12 to 15 minutes. Makes 12 biscuits depending on size you make them. Note: I use a 15 ounce vegetable can to cut these out because it makes large biscuits. You can use whatever size you cutter you want. In a bowl whisk together the milk and sugar until you get the consistency you want to drizzle over the hot biscuits. These Sour Cream Cinnamon Biscuits are so good! This is a recipe you'll make over and over again. In a large bowl whisk together the flour, baking powder, sugar, cinnamon, nutmeg and salt. Cut the butter in pieces and add to flour mixing until your flour looks like coarse crumbs. Add sour cream, vanilla and mix well with a spoon. Fold in raisins and milk and make into a dough, adding flour if needed. Pat or roll dough out (I just pat it out with my hands) on a hard surface and cut with a biscuit cutter. Place biscuits on a baking sheet. Bake in preheated 425 degree oven 12 to 15 minutes. I use a 15 ounce vegetable can to cut these out because it makes large biscuits. You can use whatever size you cutter you want. Don’t forget to pin sour cream cinnamon biscuits. Feel free to share by clicking on the Facebook, Pinterest or Twitter icons below. How about pecans instead of raisins? Do you think it would be possible to freeze these? I’ve never tried it but I don’t see why you couldn’t freeze them. Thanks! Maybe, the consistency difference in the two flours? Most recipes for biscuits will usually take more flour. You just kind of have to use your own judgement, Bridget. We love these and so happy you had fun making them. How thick do you roll these out? About 1/2 inch thick, Cindy. Oh my….will report back to you…. Oh thank you for this recipe. I love biscuits and anything cinnamon. I’m going to try this with half whole wheat flour to make them a little bit healthy. Another biscuit recipe? Wonderful! These look amazing. Well, that drizzle just puts these over the top in deliciousness! I’ve been on the hunt for a fluffy biscuit and these look to be it!